Tourism in Iran is diverse, providing a range of activities from hiking and skiing in the Alborz and Zagros mountains, to beach holidays by the Persian Gulf and the Caspian Sea, but the main reason that tourist visit Iran is because of Iran Cultural and Iran History and places such as Persepolis, Naghsh-e Rosta, Naghshe Jahan and other places in Iran also we have near 22 World Cultural Heritage . The Iranian government has been making concerted efforts to attract tourists to the various destinations in the country and arrivals have increased during the past few years. Kish Island alone attracts around 1 million visitors per year, the majority of whom are Iranian but the area also attracts many non-Iranian Muslims who like to have beach holidays with Islamic style beaches where men and women use separate beaches . Before the Iranian revolution, tourism was characterized by significant numbers of visitors traveling to Iran for its diverse attractions, the country boasts cultural splendours and a diverse and beautiful landscape suitable for a range of activities. Tourism declined dramatically during the Iran–Iraq War in the 1980s. Since the Iranian revolution in 1979, the majority of foreign visitors to Iran have been religious pilgrims and business people. In Iran there are many Shi’iteShrines, the two main ones being Imam Reza Shrine in Mashhad and Fatimah al-Ma’sūmah Shrine in Qom. Each year millions of pilgrims from Iran and other Shi’ite countries visit these holy places. Official figures do not distinguish between those traveling to Iran for business and those coming for pleasure, and they also include a large number of diaspora Iranians returning to visit their families in Iran or making pilgrimages to holy Shia sites near Mashhad, Qom and else where .Domestic tourism in Iran is one of the largest in the world.The government continues to project strong rises in visitor numbers and tourism revenue for the foreseeable future, and plans to build an additional 100 hotels to expand its currently limited stock. In 2013, the number of foreign tourists in Iran reached 4.76 million, contributing more than $2 billion to the national economy. The strong devaluation of the Iranian Rial since early 2012 is also a positive element for tourism in Iran. Over five million tourists visited Iran in the fiscal year of 2014-2015, ending March 21, four percent more year-on-year. The most up-to-date figures from the World Tourism Organisation for the origin of visitors to Iran show that building up visitors from the Islamic and wider Asian world will have to start from a low base. Around three-quarters of those entering Iran in 1999 came from Europe. According to the New York Times, unlike most Americans who stopped visiting Iran after the Revolution, European tourists continued to visit the country in similar numbers after the revolution. This was mainly because the Revolution was far more Anti-American and not so much Anti-European. It doesn’t means American can’t travel to Iran, just that Americans must have tour guide with them at all times, this law is also applicable for UK citizens and Canadians. The majority of the 300,000 tourist visas granted in 2003 were obtained by Asian Muslims, who presumably intended to visit important pilgrimage sites in Mashhadand Qom. Several organized tours from Germany, France, the UK and other European countries come to Iran annually to visit archaeological sites and monuments. Iran has 21 places on the world cultural heritages list, because of this lots of cultural tourist come to visit Iran each year. According to Iranian officials about 1,659,000 foreign tourists visited Iran in 2004 – although government statistics don’t distinguish between tourism, business and religious pilgrims; most came from Asian countries, including the republics of Central Asia, while a small share (about 10%) came from North America and the European Union, including Germany, Italy, Bulgaria, France and Belgium. The most popular tourist destinations are Northern Iran, Isfahan, Mashhad, Yazd and Shiraz. There is undoubtedly great scope for increased visitors from the Islamic world, and possibly also from non-Muslim countries with which Iran is developing business and political links, such as China and India. Cyrus‘ tomb lies in Pasargadae, a UNESCOWorld Heritage Site. Iran is home to 22 historic sites which have been inscribed on UNESCO World Heritage List. In general, Iran has tried to improve its complex and time-consuming visa application process and has begun to issue week-long visas for the nationals of 68 countries at airports. An online hotel reservation system has been developed. Iran will equip all airports with electronic visa facilities by February 2009 to issue online entry permits to foreign nationals. Visas can now be secured electronically and be collected from Iranian consulates or international airports. Iran has 15 road border crossings connecting it with Iraq, Turkey, Afghanistan, Pakistan, Turkmenistan, Armenia and Azerbaijan. Rail lines from Turkey and Turkmenistan can also be used to enter Iran.About 70% of visitors arrived by land in 2002, about 29% by air and less than 1% by sea. The price of internal flights is heavily subsidised, deterring competition and hampering profitability. In April 2005 the Imam Khomeini International Airport was reopened under the management of a consortium of four local airlines—Mahan Air, Aseman, Caspian Air and Kish Air—although no formal contract appeared to have been awarded. Iran’s Cultural Heritage, Tourism and Handicrafts Organization is responsible for the establishment, development and operation of tourism facilities in Iran, planning for the repair or extension of tourism facilities through direct investment or providing loans to the private sector or entering into partnership with the private sector, issuing licenses and supervising the establishment and administration of hotels and restaurants and travel agencies and qualification and rating of these units. Area considered for further expansion in the tourism sector in Iran are eco tourism, coastlines, restoration of historical relics, handicraft townships, and health tourism (e.g. water therapy). 30,000 people come to Iran each year to receive medical treatment (2012). As a matter of fact, Iran might become the leading country in the Islamic World when it comes to the medical tourism field due to a number of reasons that include the country’s unique geographical position, the fluctuation of Iranian currency that leads to lower prices in healthcare services, as well as the development in medical research and technology. The rapid growth rate of the healthcare system which, according to the World Tourism Organization, has increased of 5% in last decade, seems to indicate that in the future Iran will be one of the most visited countries by medical tourists, above all coming from the neighbouring countries, such as Arzebaijan, Iraq and Persian Gulf States. Iran’s ’20-Year Vision’ document projects investment of over $32 billion in the country’s tourism sector and tragets 20 million tourists by 2025. In order to encourage domestic and foreign direct investment in this sector, the 50 percent tax exemption previously granted to tourism enterprises has been extended to include five-star hotels. 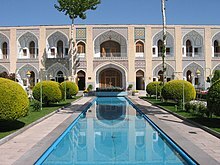 In 2016 Iran announced that it will grant 100 percent tax holidays between five and 13 years depending on the region for hoteliers investing in Iran. Tariffs for utilities comply with industrial ones. Investment in Iran’s free trade zones are exempt from taxes for up to 20 years. As of 2016, international hotel operators investing in Iran are Rotana (Abu Dhabi), Accor (France), Meliá (Spain) and Steigenberger (Germany) among others. §.^ The surveys producing these world rankings have been done in different times and might not be current. Please refer to the specific articles or sources for updated information, where available. Furthermore in most surveys only the important countries in the respective fields have been surveyed, thus the ranks might not be out of the whole world and all the countries. It should also be noted that the rankings are based on surveys by numerous entities with different benchmarks and standards, thus caution is needed in their interpretation of final results specially in the case of subjective field matters, as some of these rankings maybe based on speculative, biased, subjective or politicized evaluations. Finally, it is always important to consider trend when making comparisons, since single point data may be exceptional in nature (e.g. Iran’s 2008 drought and wheat production). 749 – Abu-Moslem Khorasani in power. 1051 – Kakuyid Faramurz in power. 1070 – Ali ibn Faramurz in power (approximate date). 1119 – Masjed-e ʿAtiq (Friday Mosque) built by ʿAlāʿ-al-Dawla Garšāsp. 1141 – Atabegs of Yazd in power. 1228/1229 – Mahmud Shah in power. 1271/1272 – Ala al-Dawla in power. 14th century CE – Muin al-Din Yazdi writes history of Yazd. 1307/1308 – Duvazdah Imam (tomb) built. 1318 – Muzaffarid Mubariz al-Din Muhammad becomes governor. 1320 – Shah Kamal madrasa built. 1324 – Jame Mosque of Yazd built. Italian traveller Odoric of Pordenone visits city. 1346/1347 – City walls expanded. 1365 – Tomb of Šams-al-Din Moḥammad built (approximate date). 1368/1369 – Masjed-e Rig (mosque) built. 1385/1386 – Mosque of Ḵᵛāja Ḥāji Abu’l-Maʿāli built. 15th century CE – Historians Ahmad ibn Husain Ali Katib and Jafar ibn Muhammad ibn Hasan Jafari each write histories of Yazd. 1405/1406 – Iskandar b. Umar Shaykh becomes governor. 1421/1422 – Bazaar built near Mehriz gate. 1457 – Haji-Qanbar Bazaar built. 1720s – Ghalzai Afghans in power. 1742/1743 – Mirza Husayn becomes governor. 1747 – Mohammad Taqi Khan becomes governor (until 1798). 1920 – Population: 45,000 (approximate estimate). 1931 – Factory in business. 1935 – Pahlavi Street constructed. 1940 – Yazd Ateshkade (Zoroastrian building) opens. 1976 – City Hall built. 1982 – Population: 193,000 (estimate). 1991 – Shahid Ghandi Yazd (football club) formed. 2004 – Foolad Yazd F.C. (football club) formed. 2009 – Yazd Solar Power Station commissioned near city. 2013 – 14 June: Local election held. 2014 – Tarbiat Yazd F.C. (football club) active. The following is a timeline of the history of the city of Tabriz, capital of East Azerbaijan Province in Iran. One of the unearthed thumb in Blue mosque excavation site, 1500 B.C. 2nd to 7th century AD The earliest elements of the present Tabriz are claimed to be built either at the time of the early Sassanids in the 3rd or 4th century AD, or later in the 7th century. The Middle Persian name of the city was T’awrēš. 8th century C.E. – Tabriz Bazaar construction begins. 858 C.E. – A devastating earthquake happened in Tabriz. 1041 – A devastating earthquake happened in Tabriz. 1208 – annexed by the army of Kingdom of Georgia under command of brothers Ivane and Zakaria Mkhargrdzeli. 1275 – Marco Polo traveled through Tabriz on his way to China. 1298 – Sham-i Ghazan built (approximate date). 1299 – City becomes Ilkhanid capital. 1300 – Rab’-e Rashidi (academic center) built. 1305 – Ghazaniyya (tomb) built. 1311 – Masjid-i Alishah built (approximate date). 1314 – Madrasa of Sayyid Hamza built. 1320 – Arg of Tabriz built. 1330 – Dimishqiyya built (approximate date). 1340 – Masjid-i Ustad-Shagird and Alaiyya built. 1370 – Imarat-i Shaikh Uvais built (approximate date). 1375 – City becomes capital of Kara Koyunlu territory. 1392 – City besieged by Timur. A 16th-century map of Tabriz, sketched by Matrakçı Nasuh (Ottomanpolymath). A miniature depicted of 2nd Shah of the Safavid dynasty Tahmasp I in Tabriz. 1406 – Kara Koyunlu in power. 1465 – Blue Mosque and Muzaffariyya built. 1468 – Uzun Hasan in power. 1469 – City becomes part of Ak Koyunlu territory. 1472 – Capital relocates to Tabriz from Amid. 1475 – Masjid-i Hasan Padshah and Maqsudiyya built (approximate date). 1483 – Hasht Bihisht palace built. 1500 – Population: 300,000 (approximate). The fifth most populated city in the world. 1501 – Safavid Ismail I in power. 5 September: City taken by Ottoman Selim I. 1534 – Ottomans in power. 1535 – Safavids in power. Ottomans in power, succeeded by Safavids. Capital relocates from Tabriz to Qazvin. 1555 – Persians in power per Treaty of Amasya. 1585 – Ottomans in power. Tauris sketched by Jean Chardin, 1673. Sketch of Tabriz in 1690. 1603 – Safavids in power. 1610 – Ottomans in power. 1611 – Safavids in power. 1635 – City sacked by Ottoman Murad IV. 1636 – Saheb-ol-Amr Mosque built. 1655 – Madrasa Sadiqiyya built. 1676 – Madrasa Talibiyya built. 1721 – Earthquake kills eighty thousands. 1724 – Ottomans in power. 1724–1725 Ottoman invaders killed about two hundred thousands of city residents. 1730 – Safavids in power. 1736 – City becomes part of Afshar territory. 1747 – City becomes part of Khanate of Tabriz. 1757 – Mohammad Hasan Khan Qajar takes city. 1762 – City incorporated into Zand realm. 1780 – 28 February: Earthquake kills about two hundred thousands of the city residents. 1785 – Qajars in power. 1799 – Qajar prince Abbas Mirza appointed as the governor of the city. 1808 – Population: 250,000 (estimate). 1817 – Printing press in operation. 1826 – Russians take city. 1827 – City becomes part of Russian Empire. 1828 – Qajars took power in the city. 1860 – Tehran-Tabriz telegraph begins operating. 1868 – Constitution House of Tabriz built. American Memorial School in Tabriz established. Teachers of Memorial School of Tabriz, photographed in 1923. 1908 – Sardar Homayun Vali Qasem appointed as Tabriz first mayor. 19 April: Howard Baskerville, the American teacher in Tabriz and a supporter of constitutionals, got killed in battle. 29 April: Russians Cossacks take city. 29 April: Monarchists siege of the city failed with arrival of Russian forces. 1910 – Population: 200,000 (approximate). December: Occupation of Tabriz by Russian army in 1911. 30 December: Seqat-ol-Eslam executed with 10 other constitutionals and nationalists by Russian Cossacks. 1916 – Jolfa-Tabriz railway begins operating. Tabriz Fire Fighting Tower built. Tavakoli matches factory established as one of the first private factories. 28 February: Ismaeil Nowbari head of local Democrat party took control of the city. 18 June: Tabriz occupied by Ottoman forces. 4 September: Iranian Cossacks take control of the city after retreating of Ottoman forces. Late summer: Khiyabani‘s revolution suppressed with help of Cossacks. 1921 – Tarbiat library established. 7 February: Major Lahuti’s revolt crashed. Persian Cossaks take control of the city. 1925 – City becomes part of Imperial State of Persia. A major flood caused a lot of damages to central parts of the city, including Ali Qapu. 1937 – City becomes capital of Eastern Azerbaijan province. 1941 – Tabriz occupied by Red Army as part of Anglo-Soviet invasion of Iran. 1945 – November – City becomes capital of Azerbaijan People’s Government. Soviet troops retreat from the city. November: Azerbaijan People’s Government collapsed by Iranian Imperial Army. 1947 – June: University of Azerbaijan established. 1950 – Tabriz International Airport begins operating. 1951 – Azarbayijan-i ayandah newspaper begins publication. 1958 – Azerbaijan Museum established. 1963 – Population: 387,803 (estimate). 1967 – As a beginning point to industrialization of the city Mashin Sazi Tabriz factory is established. 1968 – Iran Tractor Manufacturing Company (the biggest industrial complex in northwest of Iran at the time) established in Tabriz. 1969 – Machine Sazi Football Club formed. 1970 – Tractor Sazi Tabriz Football Club formed. 1973 – Reconstruction of Blue Mosque is accomplished. 1976 – June: Part of 1976 AFC Asian Cup‘s final tournament held in Baghe Shomal stadium, Tabriz. 1977 – 12 December: students’ protest in University of Tabriz in anniversary of establishment of provincial government of Azerbaijan, was brutally attacked by the military units. February: As part of Iranian refinery complexes Tabriz oil refinery is established. 18 February: The protest against shah became violent after one of the protesters shot dead. This incidence intensified the rise up of people through the country for revolution of 1979. December: large protest against unfair treatment of Azerbaijani minorities. Varliq, a quarterly publication Azerbaijani magazine established. March: Protest in support challenging the new constitution suppressed brutally by central government. September: Air strike on Tabriz Airport and Tabriz Oil Refinery by Iraqi Air force at the first day of Iran–Iraq War. 1982 – Population: 852,000 (estimate). Azerbaijan Cycling Tour (race) begins. Shahrdari Tabriz Cultural and Athletic Club formed. Sahand University of Technology established. Azarbaijan Shahid Madani University established. East Azerbaijan province split into a smaller East Azerbaijan province, and Ardabil province. 1995 – 21 May: Student protest against unfair treatment of Azerbaijani minority by IRIB. Yadegar-e Emam Stadium and Museum of Constitution open. Tabriz Petrochemical Co is established. Student protest to support Tehran University’s student movement for more political freedom. 2000 – Provincial TV station of Sahand begins broadcasting. 2001 – Ehtesham Hajipour selected as new mayor of the city. 2002 – April: Tabriz Cartoon, an international annual cartoon contest started. Alireza Navin selected as new mayor of Tabriz. Amir Nezam House museum and Iron Age Museum open. May – Thousands of ethnic Azeris demonstrated in Tabriz against government official newspaper’s (Iran) cartoon insulting Azerbaijani minority. 2009 – Gostaresh Foolad Football Club formed. 2010 – Bazaar Complex is inscribed as World Heritage Site. August: A protest for saving Lake Urmia is suppressed by police. 18 February: Construction of the tallest building in city, Bloor Tower, is accomplished. 11 August: A major earthquake in Varzaqan shocked Tabriz. Air pollution in Tabriz reaches annual mean of 40 PM2.5 and 68 PM10, more than recommended. 14 June: Local election held. 15 June: Thousands of city residents came to streets to celebrate the victory of Iranian moderate presidential candidate, Hassan Rowhani. November: Sadegh Najafi-Khazarlou is selected as the 55th mayor of Tabriz. 29 March: Tabriz celebrated the earth hour for the first time by turning off Saat Tower‘s lights. 25 December: Tabriz Soccer Museum is established. City becomes part of newly formed national administrative Region 3. 27 August: First portion of Tabriz Metro started its services. 4 November: Iraj Shahin-Baher is selected as the 56th mayor of Tabriz. c2000 BC – A settlement of the Iranian people is located at or near the current site of the city. Clay tablets referring to this settlements were found in the 1970s. C750 BC – Cambosys sets the foundations of the first Persian empire. C650 BC – Cyrus, son of Cambosys, defeats all local, regional, and continental wide kingdoms. He forms the Achamenid empire extending from North Africa, And the Meditranea to India and western China. It encompasses the largest percentage of earths population under one rule. A record that has never been broken to present day. 640–653 CE – Fārs falls to the Arab armies of Umar. Shiraz in 641. Estakhr in 653. 650–869 – Seat of the Arab government of Fārs. Controlled from Baghdad with very limited Persian activity. Other towns in the region decline as Shiraz grows with new immigrants. Turkish tribes are brought to the region to serve as soldiers in the Arab army. Descendents of these tribes form ruling dynasties of the region in the next several centuries. 790 – Shiraz scholar Sibawayh publishes his writings. This is the first formal basis of Arabic Grammar. 9th century – Shirazi wine is praised as the best of the Middle East. 869 – Saffarid dynasty leader Yaqub Leis liberates Shiraz. Baghdad Caliphate rule weakened. Many Arabs and Turks in the city are eliminated but a significant number choose to stay in Shiraz, as they have adopted Persian culture. 894 – Atigh Jame’ Mosque built by Amr-o-Leis Saffari (Yaqub’s brother). 933 – Shiraz is Capital of the Buwayhid dynasty. Becomes cultural center under Emmad-al-dowleh, first Buyid Amir. 937 – Buyids eventually bring down the Caliphate of Baghdad and Shiraz gains international prominence. Literature, science, art and culture are promoted. Religious minorities are treated well. Christaians, Jews and Zoroastrians are among the ministers and consultants of the Buyid Amirs. c950 – Subterranean canal made in the mountains to bring fresh water to the city by Rokn-al-dawleh, Emmad’s brother. The stream (called Abeh Rokni) still runs today, and is immortalized in poetry of Shiraz. c1000 – First wall built around Shiraz due to attacks by Seljuk Turks, (see also Turkmens). The Seljuks were supported by the Damascuss-based remainder of the Caliphate, against the Buyids. c1010 – Over the next 50 years this war, as well as internal feuds among the Buyids destroys much of the city. 1062 – City is eventually captured by Seljuks, However, to the dismay of the Caliphate, the new rulers quickly adopt the Persian culture and many settle in Shiraz. The Seljuks actually become great patrons of Persian art and culture, as they build a great empire. c1075 – Shiraz is rebuilt to splendor by Seljuk Attabak Jalal-ed-din and his sons. Development attracts new immigrants from all corners of Persia, as well as Central Asia. 1090 – Revolts within the Seljuk army are prompted and supported by Damascuss and Baghdad as the First Crusade weakens the Seljuk military might, and empire. Successful rebels in Shiraz are the Songhorid Turks. 1100 – Shiraz becomes capital of the Songhorid dynasty of Turkish origin (Attabak-ane Fars). 1100 – Although they promote Sunni Islam on behalf of Baghdad, the Songhorid also eventually become die hard Persians. They settle in and rebuild Shiraz as their home. 1105 – A wall is restored to encircles the city with Eight gates. Influence of the Baghdad Caliphate is contained to mostly ceremonial terms. c1110 – Hanafi sect of the Sunni Muslims rule the region from Shiraz. Although Judaism, Christianity and Zoroastrianism are still freely practiced among a large minority in the city and the region. This tolerance promotes another migration wave into the city and the region. Many tribes of Turkish and Cacauss regions move to Shiraz, and surrounding areas. Many still live in the region (Qashqai, Lurs). c1115 – Shiraz is a center of the pious and the Jurists of the nation. Number of religious shrines are built, many of which are still standing, among them: Masjid Atiq, Masjid Now. 1170 – Sheikh Ruzbehan (1128–1209), establishes own Sufi sect in Shiraz. 1150–1195 – Decline of Shiraz as dynastic feuds among the various ruling tribes and a famine ruin the city. 1195 – Saad ibn Zangi, a local Attabak, establishes rule and restores the city. 1210 – Future poet Saadi Shirazi born in Shiraz (approximate date). 1280 – Shiraz saved from Mongol invasion by diplomacy of Abu Bakr ibn Saad. Genghis Khan is so enamoured by the Persian ruler that names him Ktlug Khan and considers him a friend. 1281 – Grave site of Ahmad-ibn-Musa (son of the 7th imam of the shiites) is identified by Amir Moqarrab-alDin a Vazir of Abu Bakr, during excavation for a palace. 1282 – A shrine is built on the grave site. Today it is the holiest Muslim site in the city and the region, (Shah Cheragh). 1284 – Decline of Shiraz due to the high Taxes imposed by Mongols. Corruption and feuds resume. 1287 – Drought and Famine kills approximately 100,000 people in Shiraz. 1291 – Saadi dies and is buried in his garden next to an artesian well. Currently the beautiful gardens are a major tourist attraction, with a still flowing well and stream next to Saadi’s tomb. 1297 – Measles and Plague kill another 50,000 people in Shiraz and surrounding area. 1297 – Female ruler Aubee Khatton and her daughter Kurdujin save lives and the city by their charitable foundations. They were Songhorid matrons who had married into the Mongols. 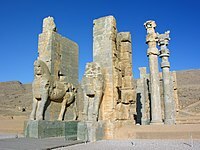 1304 – Injuids dynasty takes over and rebuild Shiraz, but their in-fighting eventually causes more destruction. Future poet Hafez born in Shiraz. Ilkhanate period. Their rule is marked by warfare and destruction. 1353 – The Muzaffarid dynasty captures Shiraz. Once again Shiraz is the capital for Persia. c1350 – Traveller Ibn Battuta visits Shiraz and documents a great city, rich with gardens, streams, bazaars, and cleanly clothed people. 1357 – Muzaffarid Shah Shuja takes reign and revives the city. 1360 – Hafiz (1310–1380) is patronized by Shah Shuja and settles in Bage-Mossalla where he establishes a great following. His tomb in the same garden is a revered and major tourist attraction for world travellers and Iranians alike. 1382 – Shah Shuja gives Timur’s army with gifts and saves the city from Pillage again. 1384 – After the death of Shah Shuja in-fighting flares up among the Muzaffarids and leads to several battles in Shiraz and eventual city decline. 1387 – Shirāz is occupied for a short period by Timur. 1393 – Timur occupies Shirāz for the second time and spent a month there “rejoicing and feasting”. He appoints his grandson who has adopted the Persian culture as governor. Rebuilding of the city resumes. 1400 – Shiraz is known as the city of Saadi and Hafez. Their tombs, still intact today, become shrines. 1410 – Shiraz prospers with a population of 200,000. For a few years it is the capital of the Turkmen Aq Qoyunlu rulers. 1470 – Mongols and Turkmen, the invaders, are soon ousted from the city. 1503 – Saffavid ruler Shah Ismaeel captures Shiraz and kills or exiles most Sunni leaders to promote Shiism. 1550 – Allah-verdi Khan and his son Emam-Qoli-Khan governors of the Saffavid rebuild city. 1575 – Shiite followers grow in numbers, schools and shrines are built. Many are still standing, Madrese Khan. c1600 – Shiraz wine discovered by the British and reported to be one of the best in the world. 1621 – British and French merchants frequent the city. Grapes are taken to Europe. 1630 – A flood destroys large parts of the town. 1634 – Mulla Sadra, a well known philosopher from Shiraz is prosecuted for heretical writings and opinions. He promotes the idea of a free thinking Moslem and writes against the practice of blindly following the edicts of the clergy (Thaghlid). 1668 – Another flood hits Shirāz. 1724 – Shirāz is sacked by Afghan invaders. 1744 – Nader Shah of the Afsharid dynasty captures Shiraz. Large sections of the city destroyed during wars. Karim Khan Zand moves to Shiraz and takes the title People’s Representative, (Vakil-ol-Roaya). He establishes the Zand Dynasty. Shirāz becomes capital of the Zand dynasty. City is rebuilt. Structured into 11 quarters (10 Muslim and one Jewish). Huge moat and wall surround the city, with six gates. Culture, Arts and minorities flourish. 1794 – End of the Zand dynasty, and Shirāz’ status as capital. 1794 – Shiraz captured by Agha Mohammad Khan Qajar, pillaged and destroyed. 1822 – Plague and Cholera epidemics kill thousands. 1824 – An earthquake destroys parts of the town. 1830 – Plague of locusts destroys the crops, local agriculture and creates famine. Tens of thousands die and many more move out of the city. Population decreases to only about 19000 by diseases and outmigration. 1844 – A young merchant, Sayyid `Alí Muhammad and given the title of ‘The Báb‘ (Arabic, meaning ‘The Gate’), declared His Messianic mission and founded the Bábí Faith. 1853 – Another major earthquake hits Shirāz. 1860 – British influence prevails in southern Iran and Shiraz. The British are actively opposed by the native Qashqai tribes in the mountains outside the city. 1869 – Shiraz economy affected by opening of the Suez Canal in Egypt. 1872 – Fars newspaper begins publication. 1880 – Qavam family suppresses local unrests with the help of the British Indian Rifelmen. 1883 – First official census shows a population of 53,607. 1907 – Sur-e Esrafil, a widely circulated newspaper published in Shiraz by Mirza Jahangir Khan Shirazi, supports the Persian Constitutional Revolution. Qashqai leaders support Mirza Jahangir Khan in revolt against the government. 1908 – Mirza Jahangir Khan is executed and his paper shut down. 1911 – Seyyed Zia’eddin Tabatabaee, a local shiite leader publishes newspaper Banaye-Islam with the help of the British consulate in Shiraz. 1913 – The Fars newspaper begins publication. 1918 – Qashqai tribesmen with leader Naser Khan besiege the city. Central government power declines in Iran. British influence increases with the discovery of oil. They help local associates to suppress tribal revolts throughout the region. 1919 – Influenza epidemic kills 10,000. Iran is falling apart with Russian and British invasions from the north and south respectively. Shiraz belongs to the British. 1921 – Qajar dynasty ends. Reza Shah Pahlavi takes over, with Seyyed Zia’eddin Tabatabaee at his side. 1945 – Shiraz University opens. 1962 – Pahlavi University founded. 1963 – Population: 229,761 (estimate). 1967 – Shiraz Cultural Festival begins. 1982 – Population: 800,000 (estimate). 2005 – Census reports show a population of 1,255,955. 2014 – City becomes part of newly formed national administrative Region 2. The following is a timeline of the history of the city of Qom, Iran. 685 – Arab Shia Muslim refugees settle in Qom. 816 – Death of Fātimah bint Mūsā (sister of 8th Imam of Twelver Shia Islam); shrine develops thereafter. 988 – Ḥasan b. Moḥammad Qomi writes Tāriḵ-e Qom (city history). 1034 – Hassan-i Sabbah born in Qom (approximate date). 1224 – City besieged by Mongol forces. 1393 – Timur in power. 1442 – City becomes seat of government of Timurid monarch Sultan Muhammad bin Baysonqor. 1447/1448 – City sacked by Qara Qoyunlu forces. 1469 – Ağ Qoyunlu in power. 1501 – Twelver Shia Islam declared official state religion in Iran, a development beneficial to Qom as a holy city (approximate date). 1722 – Qom sacked by Afghans. 1883 – “New court” built at the Fatima shrine. 1920 – Population: 30,000-40,000 (approximate estimate). 1922 – Qom Seminary (hawza) established. 1923 – Printing press in operation. 1950 – Population: 83,235 (estimate). 1960 – Population: 105,272 (estimate). Religious leader Khumayni arrested and exiled. 1974 – Mohemmat Sazi Football Club formed. 1978 – 7-9 January: Iranian Revolution against Pahlavis begins in Qom. 1982 – Population: 424,000 (estimate). Center for the Revival of Islamic Heritage established. 1999 – February: Local election held. 2008 – Yadegar-e Emam Stadium opens. December: Funeral of religious leader Hussein-Ali Montazeri. 2014 – City becomes part of newly formed national administrative Region 1. The following is a timeline of the history of the city of Mashhad, Iran. 818 – Death of Ali al-Ridha (8th Imam of Twelver Shia Islam) at Sanābādh; Imam Reza shrine established. 970s-990s – Imam Reza shrine demolished “in an act of fanaticism” by Ghaznavid Nāṣer-al-dawla Sübüktigin. 1009 – Imam Reza shrine rebuilt. 1121 – Town wall built. 1161 – Mashhad sacked by Ghuzz Turks. 1389 – Nearby Tus besieged and “left a heap of ruins” by forces of Timurid Miran Shah; refugees flee to Mashhad. 1418 – Goharshad Mosque built. 1426 – Bala-yi sar madrasa built at the Imam Reza shrine. 1439 – Du-dar madrasa built at the Imam Reza shrine. 1501 – Twelver Shia Islam declared official state religion in Iran, a development beneficial to Mashhad as a holy city (approximate date). 1507 – Mashhad taken by forces of Uzbek Muhammad Shaybani. 1544 – Mashhad sacked by Uzbek forces. 1589 – Mashhad besieged by forces of Shaybanid Abd al-Mumin. 1598 – Mashhad taken by forces of Abbas I of Persia; Uzbeks defeated. 1722 – Afghan Abdalis in power. 1726 – Mashhad besieged by Persian forces. 1753 – Mashhad besieged by forces of Afghan Ahmad Shah Durrani. 1803 – Mashhad besieged by forces of Fath Ali Shah. 1849 – Mashhad taken by forces of Husam al-Saltana. 1876 – Palace of Abbas Mirza built. 1912 – 29 March: Bombing of city by Russians. Mashhad municipality (administrative entity) formed. 1920 – Population: 70,000-80,000 (approximate estimate). 1949 – Razavi University established. 1959 – Nader Shah Mausoleum erected. 1963 – Population: 312,186 (estimate). 1964 – Astan Quds Razavi Central Museum inaugurated. 1966 – Mashhad railway station opens. 1982 – Population: 1,120,000 (estimate). 1983 – Samen Stadium opens. 1995 – Central Library of Astan Quds Razavi new building opens. City becomes part of the newly formed Razavi Khorasan Province. Mashhad Urban Railway begins operating. Siah Jamegan Aboumoslem Khorasan F.C. (football club) formed. Imam Reza Stadium construction begins. City becomes part of newly formed national administrative Region 5. The following is a timeline of the history of the city of Kerman, Iran. 3rd century CE – Bardašir/Govāšir founded by Ardashir I. 644 – Muslim conquest of Kerman occurs (approximate date). 932 – Moḥammad b. Elyās in power. 1012 – Buyid Qawam al-Dawla in power. 1048 – Seljuq Qawurd in power. 1188 – Seljuqs ousted (approximate date). 1222 – Amir Barāq Ḥājeb in power. 1349 – Friday Mosque of Kerman (fa) built. 1390 – Masjid-i Pa Minar (mosque) built. 1596 – Ganj Ali Khan becomes governor. 1598 – Ganjali Caravanserai construction begins. 1625 – Ganjali Mint built. 1631 – Ganjali Bathhouse built. 1660s – Offices of English East India Company and Dutch East India Company in business. 1758 – Karim Khan in power. 1794 – Siege of Kerman (fa) by forces of Agha Mohammad Khan Qajar. 1801 – Ibrahim Khan becomes governor. 1878 – Firuz Mirzā Farmānfarmā becomes governor. 1905 – Balasari and Shaykhi unrest. 1906 – Iranshahr High School of Kerman (fa) established. 1917 – بیمارستان نوریه (fa) (hospital) founded. 1969 – خانه شهر (fa) (assembly hall) built. 1970 – Kerman Airport begins operating. 1978 – Friday Mosque of Kerman fire (fa). 1998 – Sanat Mes Kerman F.C. (football club) formed. 2003 – 19 February: Airplane crash occurs near city. 2007 – Shahid Bahonar Stadium opens. 2012 – Mohammad Mehdi Zahedi becomes Member of the Parliament of Iran from the Kerman and Ravar (electoral district) (fa). 2014 – City becomes part of newly formed national administrative Region 5. 2015 – Ali Babayi becomes mayor. The following is a timeline of the history of the city of Isfahan, Iran. 771 – Friday Mosque established in Yahudiyya (approximate date). 1051 – Isfahan besieged by Seljuk forces of Tughril; city becomes capital of the Seljuk Empire. 1070 – Nezamiyeh Madrasa built (approximate date). 1107 – Chihil Dukhtaran (minaret) erected. 1194 – Khwarazmian Ala ad-Din Tekish in power. 1226 – City sacked by Mongol forces. 1228 – City besieged by Mongol forces again. 1240/1241 – Isfahan taken by Mongol forces. 1325 – Emamzadeh Jafar (tomb/shrine) built. 1341/1342 – Shaikh Abu Esḥāq Inju becomes governor of Isfahan. 1356 – Amir Mobārez-al-Din Mo-ḥammad Moẓaffari becomes governor of Isfahan. 1387 – Isfahan besieged by forces of Timur. 1503 – Safavid Ismail I in power. 1598 – Isfahan becomes capital of the Safavid Empire; Abbas I of Persia in power. Si-o-seh pol (bridge) built to newly developed New Julfa. Maydān-i shāh (square) laid out. 1619 – Sheikh Lotfollah Mosque built. 1627 – Armenian Bedkhem Church built in New Julfa. 1630 – Shah Mosque built (approximate date). 1647 – Chehel Sotoun palace construction begins. 1650 – Khaju Bridge built. 1660 – Ālī Qāpū (palace) built (approximate date). 1670 – Hasht Behesht palace built. 1722 – Siege of Isfahan by Afghan forces. 1736 – Persian capital relocated from Isfahan to Mashhad. 1869 – Isfahan economy affected by opening of the Suez Canal in Egypt. 1874 – Mass’oud Mirza Zell-e Soltan becomes governor of Isfahan. 1919 – Zaban-e Zanan (fa) women’s magazine begins publication. 1920 – Population: 80,000 (approximate estimate). 1921 – Waṭan textile factory in business. 1953 – Sepahan F.C. (football club) formed. 1959 – Hamadāniān cement factory in business. 1971 – Āryāmehr steel mill begins operating near city. 1973 – Naqsh-e jahan derby (football contest) begins. 1977 – Ālī Qāpū, Chehel Sotoun, and Hasht Behesht palaces restored. 1979 – Naqsh-e Jahan Square designated an UNESCO World Heritage Site. 1984 – Isfahan International Airport opens. Mehdi Jamalinejad becomes mayor of Isfahan. The following is a timeline of the history of the city of Hamadan, Iran. 640s – Arabs in power. 806 – City besieged by forces of al-Amin. 931 – City besieged by forces of Ziyarid Mardāvij. 976 – Buyid Mu’ayyad al-Dawla in power. 997 – Shams al-Dawla in power. 1021 – Sama’ al-Dawla in power. 1221 – City sacked by Mongols. 1224 – City sacked by Mongols again. 1315 – Gunbad-i Alayvian (fa) built (approximate date). 1724 – City sacked by forces of Ahmad Pasha of Baghdad. 1732 – City taken by forces of Nāder Shah Afšār; Ottomans ousted. 1789 – Agha Mohammad Khan Qajar takes Hamadan. 1838 – Congregational mosque built. 1883 – Imamzadeh Hossein, Hamadan (fa) (shrine) built. 1932 – Hamadan power plant (fa) built. 1933 – City redesigned to accommodate motorcars; central Meidun-e Emam Khomeini and 6 radiating boulevards laid out. 1952 – Avicenna Mausoleum erected. 1963 – Population: 114,610 (estimate). 1970 – Baba Taher Mausoleum (fa) erected. 1973 – Bu-Ali Sina University established. 1976 – Population: 164,785 city; 229,977 urban agglomeration. 2007 – PAS Hamedan F.C. (football club) formed. 2009 – Shahid Mofatteh Stadium opens. 2014 – Syed Mustafa Rasul becomes mayor.